I go to both the Bury and Tottington salons, myself to the Bury Salon for extensions with Sarah and both my sons go to the Tottington salon. The results are always as expected. Not cheAp but you get what you pay for as i have found out at other salons. Here to stay!!! I struggled for a while to find a salon I felt comfortable with after my long term stylist moved overseas. Tried several of the prestige name salons in Manchester. On a recommendation over eight years ago I visited Kathryn at Bobbles and haven't looked elseweher since. The staf are warm and friendly whilst maintaining professionalism. It's clear to see that high standards are demanded and maintained. The complimentary head and shoulder massages are a great touch. Although I do not change my overall style of cut as I like to keep my haor long, it's great that Kathryn always takes time to discuss various ways of styling/finishing my hair differently, which gives me the motivation to try something new. Great to find somewhere that really understands individuals' needs and truly cares to deliver a 'customer experience'. I have been going to Bobbles for about six years and will continue to, even though I no longer live in Bury. Jill has always fitted me in even at short notice and does a fab cut and style. All the team make me feel welcome and at home. Love it. Have been visiting the salon for a number of years after trying a few in the area.It's not the cheapest but definitely the best. Nicola my hairdresser never fails to make my hair look great. She and the rest of the friendly staff always ask how you want your hair to look but make suggestions if you are trying to grow a style out or are looking for a change. The salon is usually busy but the staff are attentive with drinks, magazines and keeping you informed if there is a little delay. well worth a vist. I went to Bobbles after a few bad experiences at other hairdressing salons. I was made to feel welcome and I have never looked back since. Debra styles my hair fantastically well and I have never been disappointed with any of the styles she has created for me. Young Charlotte who colours my hair always does a super job and is always cheerful and chatty. I always look forward to my 6 weekly appointments and will never try anywhere else. Always a great experience. I was recommended to Bobbles by my Mum and Sister who had said wonderful things and I had noticed how fab their hair was looking. Lucy is currently our hairdresser and she does amazing hair cuts and I can safely say I will NEVER go to any one else. Quite recently I have been to a few weddings and Lucy has also styled my hair, the styles have been really creative and looked absolutely amazing - all of my friends and family commented on how beautiful my hair looked! The service is also great and prompt and my appointments have always been on time...I love the head massages that are offered after my hair has been washed and the hot drinks and biscuits are always a treat! I always look forward to visiting! 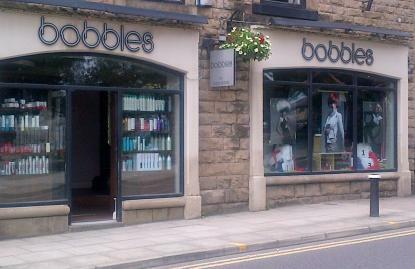 I really have to say that Bobbles in Tottington is the most beautiful,friendly,salon. I really love going and I would really recommend if you want a great hair cut then book in with Lucy she is brilliant!! Everyone has a smile for everyone and love the little biscuits you get with your coffee!!! Highly recommended !!!!! I have been coming here for 20 odd years, I love it!! Im here every 2/3 weeks and really look forward to it. All the girls look after you, they have the best training any designer could want or hope for. Mark and Kathryn have been the owners since the shop opened and take great pride in it. Keep the great work up!! !